I know i'm not the only one who struggles applying their liquid eyeliner. I try and try, and still managed to end up with a shaky line that starts in the middle of my eyelid. So you could understand my excitement when I came across 'Magic Liner' in Topshop. It's basically a felt-tip style pen with a thin nib to perfect those cat eye flicks. I tend to use Magic Ink eyeliner from Benefit, which is amazing in its own right, but it's the dipping the brush into the pot part that I thought was unnecessary. With the Magic Liner you just shake the pen and the liner flows freely onto the brush, much like a pen would. Magic Liner is just one of the many gorgeous products from Sisters of The New Moon, a limited edition makeup collection from Topshop. It features dazzling metallic nail colours and bright coral and pink lipsticks, designed to give you a futuristic high-fashion look. I love the packaging of the entire range in general. It's a shiny silver and has a gypsy fortune teller feel to it. 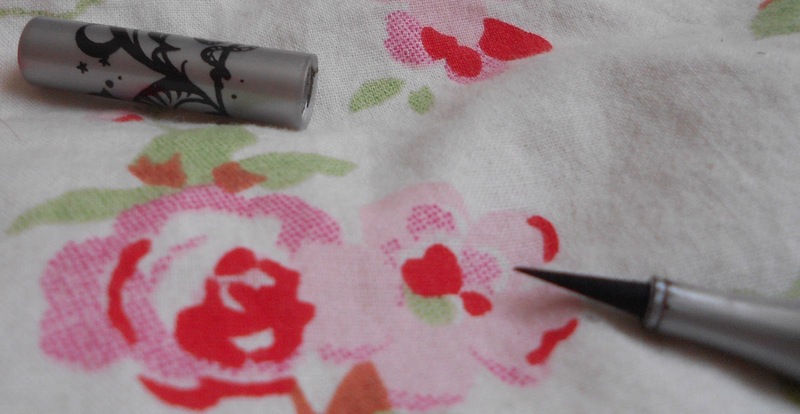 As you can see the tip is super thin for precision and enables you to layer it on to create a thicker line if needed - with eye-liner it's better to go slowly and layer it so you don't smudge it and create even thickness on both eyes! This was a simple sweep of the pen along my hand. The slightly thicker part of the line was when I pressed it a little harder, so in order to create a cat eye flick you need to make sure you don't put too much pressure on the pen and relax your hand. It's vital that you use your arm as an 'anchor'. Rest your elbow on something flat and sturdy to stable your hand, once you begin to shake that's it! I think the idea behind this is genius. However, in order to prevent the tip from going dry it instructs to store it tip facing down or on it's side, so remember that when you're throwing it into your bag. This liner is perfect for subtle flicks, or thick, dramatic eyes. You can also use the tip to create more intricate liner designs, or even use it on your nails for nail art? This really is a great eye liner. Well done, Topshop! Magic Liner is sold at your nearest Topshop for just £8. i've seen this in Topshop but never really thought to pick it up.